Supplements aren't held to the same standards as FDA-approved drugs. Evidence indicates that few are effective, many are useless, and others may be harmful. Dietary supplements—including herbs, vitamins, minerals, and other products—are a $37-billion industry in the United States, and 60% of women are taking them regularly. At the same time, mounting research is suggesting that supplements—even mainstays like calcium—may be harmful at high doses. The use of supplements and other alternatives to standard treatments is centuries old, but Dr. David Eisenberg, adjunct associate professor at the Harvard T.H. Chan School of Public Health, was the first to document the widespread use of alternative therapies in the United States. In a 1993 article in The New England Journal of Medicine, Dr. Eisenberg and colleagues reported that more than a third of Americans were using unconventional therapies, largely for chronic conditions, and most were doing so without letting their clinicians know. That report covered acupuncture, spinal manipulation, massage, and yoga, but it also focused public attention on all unconventional treatments, including the growing use of herbal remedies and other dietary supplements. In 1998, the Office of Alternative Medicine in the National Institutes of Health (NIH) was revamped as the National Center for Complementary and Alternative Medicine and charged with funding rigorous studies into the safety and effectiveness of alternative physical treatments as well as popular dietary supplements and herbs. The traditional practice of herbal medicine involves combining different herbs and using them in a variety of preparations. 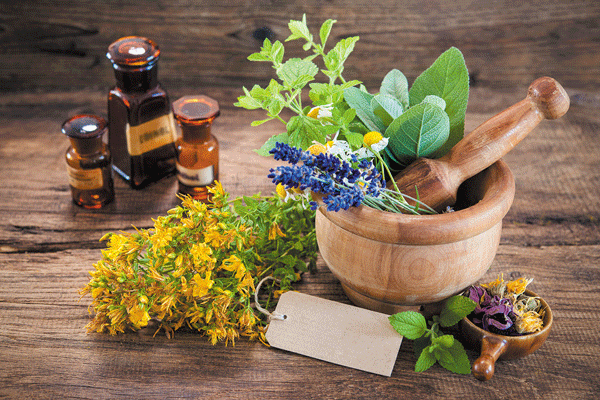 Herbal remedies marketed today are usually powders or extracts derived from plant leaves, stems, or roots. Several studies, largely NIH-funded, have put some remedies often recommended for women to the test. The results are summarized below. Black cohosh. A plant long used as a home remedy for arthritis, black cohosh has been recommended for hot flashes, night sweats, vaginal dryness, and other menopausal symptoms. Studies of its effectiveness have had mixed results. However, there are more than 50 reports of liver damage in people taking it, although it is unknown whether black cohosh or another substance in the preparation triggered the reactions. Chamomile. This herb appears to be effective in relieving anxiety. Although less potent than prescription drugs, a cup of chamomile tea may soothe your nerves. Because chamomile is related to ragweed, marigolds, chrysanthemums, and daisies, it may trigger an allergic reaction if you have asthma or are allergic to these plants. Echinacea. There is no conclusive evidence that echinacea either prevents colds or reduces cold symptoms. It may trigger reactions in people who are allergic to ragweed, marigolds, chrysanthemums, or daisies. Ginseng. Although ginseng has been touted as a remedy for everything from colds to fatigue to forgetfulness, there isn't strong evidence from clinical trials that it has any of those properties. Ginseng may also interact with aspirin and the anti-clotting agent warfarin (Coumadin). Ginkgo biloba. Extracts from the leaves of the ginkgo tree are promoted for improving memory and preventing and treating dementia. However, in the Ginkgo Evaluation of Memory study of 3,000 men and women over age 75, ginkgo didn't slow cognitive decline or reduce the incidence of dementia over a six-year period. Ginkgo may also increase bleeding risk. Milk thistle. Laboratory studies indicated that this herb, also known as silymarin, had a protective effect on liver cells, but clinical trials haven't validated any benefit. Don't count on milk thistle to compensate for the effects of a few extra glasses of wine. St. John's wort. A few early studies indicated that St. John's wort might alleviate depression, but larger trials failed to confirm those results. St. John's wort also interacts with a large number of prescription medications. Calcium. Research has indicated that high doses of calcium from supplements don't have much of an effect on bone density and increase the risk of heart disease and kidney stones. If you aren't getting at least 500 to 700 milligrams (mg) of calcium in your daily diet, you may need a supplement, but it's a good idea to limit your supplement intake to 600 mg a day. Glucosamine and chondroitin. These substances, both components of cartilage, are used to prevent arthritis and relieve joint pain. Clinical trials have shown that they have little effect. Melatonin. A synthetic copy of a natural hormone, melatonin is used for jet lag, sleep disturbances, and insomnia. Research has determined that it can be effective at doses as low as 0.5 mg. If you're considering it, talk to your doctor about dosage and timing. Vitamin D. Because most people who live in northern latitudes don't make enough vitamin D from sun exposure, a supplement may be necessary to fill the daily requirement of 800 international units (IUs). Whether higher, 2,000-IU doses reduce the risk of heart attack, stroke, or cancer will be determined by the 25,000-person Vitamin D and Omega-3 Trial (the VITAL study), whose results will be announced in 2017. Omega-3 fatty acids. Although studies have linked consuming foods high in omega-3s to a reduced risk of heart disease and inflammation, it's questionable whether omega-3 supplements—available primarily in fish oil capsules—have the same effect. The VITAL study will help to answer that question, too. Supplements for other purposes. The shelves of supplement stores abound with products that promise to make exercise easier and promote weight loss. These, too, are unproven, and some may contain stimulants that are harmful when used for extended periods. The value of most herbs and supplements has been discounted or remains unproven. Few are worth the money spent on them. Moreover, there is no guarantee that the pills, capsules, or tablets contain all—or even any—of the ingredients listed on the packaging. Most important, taking supplements can be risky. A study published in October 2015 in The New England Journal of Medicine found that the adverse effects of supplements were responsible for an average of 23,000 emergency department visits per year. If you are concerned that your diet isn't providing all the nutrients you need, don't shop for supplements before talking to your doctor. If you truly need a vitamin or other dietary supplement, your clinician can suggest an appropriate product and dose. If you're currently talking a vitamin or other supplement, let your health care team know. "Some non-vitamin supplements are marketed heavily in the absence of reliable evidence of efficacy or safety and may interact with prescription drugs. 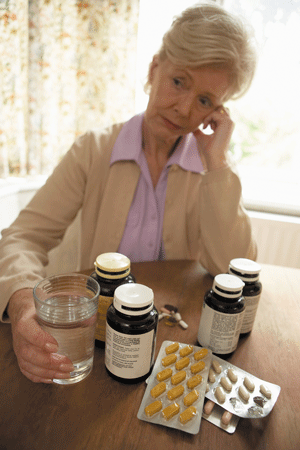 Moreover, some people may delay beginning proven therapies because they are relying on supplements. And some of these products are costly," says Dr. David Eisenberg, adjunct associate professor at the Harvard T.H. Chan School of Public Health. The supplements used in government-funded clinical studies are analyzed for purity and standardized for dose. Supplement manufacturers are required to perform such analyses and to supply the results to the FDA. Yet, according to a report aired in January 2016 by PBS's investigative series Frontline, few of the thousands of supplement manufacturers do so, and the FDA lacks the staff and resources to analyze supplements or to compel manufacturers to comply. As a result, the contents of a supplement capsule may not be what's described on the label. Canadian researchers who analyzed a random sample of 44 products from 12 manufacturers reported in 2013 that 60% of the products contained substances not listed on the labels, some of which were potentially harmful contaminants. And a 2015 investigation by the New York attorney general determined that only 21% of random samples of popular house-brands supplements purchased from GNC, Target, Walgreens, and Walmart contained the ingredients in the concentrations listed on the labels. Some contained no trace of the advertised active ingredient, and others consisted primarily of "fillers," including wheat and soy, which may trigger allergic reactions in some people. Other investigations have uncovered supplements adulterated with steroid hormones. When it comes to dietary supplements, the ancient warning "buyer beware!" is more relevant than ever.